Senate Republicans, incensed that Massachusetts Senator Elizabeth Warren spoke poorly of Jeff Sessions Tuesday night, voted to block her from participating in his confirmation hearing. In explaining their decision, Senate Majority Leader Mitch McConnell also inadvertently wrote her next campaign slogan for her. 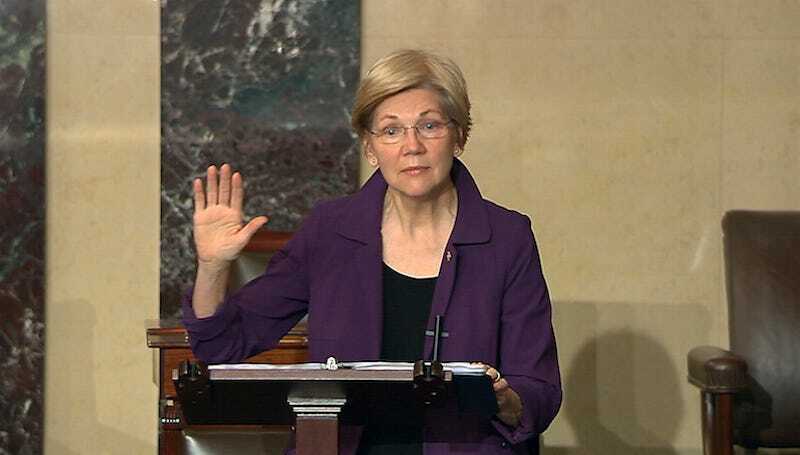 Warren was silenced under Rule 19, which prevents legislators from impugning one another on the Senate floor. Her crime? Reading a 30-year-old letter written by Coretta Scott King—the widow of Martin Luther King, Jr.—opposing Sessions’s nomination. King wrote that sentence, which is part of this longer letter, in 1986 to oppose Sessions, who was then a nominee to be a federal judge. He was ultimately scuttled for being too racist, though he was later elected to the U.S. Senate and currently seems a lock for Attorney General. Warren ultimately read the rest of the letter from outside the Senate on Facebook Live. Still Warren, who is publishing a new book in April, came out on top thanks to McConnell’s inability to stop himself while he was ahead. “She was warned. She was given an explanation. Nevertheless, she persisted,” McConnell said after the vote. His inadvertent rallying cry is already being sold on t-shirts.